Serve this dish with a steaming mound of creamy polenta, adding a handful of grated parmesan, or a potato mash made with plenty of butter and hot milk. 1 Preheat oven to 150°C (300°F). Rinse beef cheeks and pat dry with paper towels. Trim off as much fat as you can, cutting meat into irregular-shaped pieces through the lines of connective tissue. Dust with seasoned flour, reserving unused flour. Heat 2½ tablespoons of olive oil in a large heavy-based frying pan over medium-high heat and when it is hot add beef cheeks. Brown well, then transfer to a casserole. 2 Add 2 tablespoons of olive oil to pan beef cheeks were cooked in along with onion, carrots and celery. Lower heat to medium and brown vegetables (don’t let them catch and burn). Stir in garlic and rosemary and cook briefly, then tip everything into the casserole. 3 Add 1 tablespoon olive oil to pan and mix in reserved flour (if not enough flour remains to absorb oil, add a little more). Cook gently, scraping it around the pan with a metal spoon until it changes from a pale greyish colour to a tan brown; don’t have the heat too high or it might burn. Remove pan from heat and let it cool for 2–3 minutes. 4 Pour stock into pan a third at a time, stirring, and return to heat. Bring to the boil, stirring, then add wine, balsamic vinegar, 1 teaspoon of salt and bay leaves. Bring liquid back to a gentle bubble, then pour it over meat and vegetables (it should barely cover them). Loosely drape contents in casserole with a piece of baking paper, then cover casserole with a lid. Cook in oven for 2½ hours, stirring once or twice during cooking, until meltingly tender. 5 Remove casserole from oven and let it rest while making a pot of steaming, cheesy polenta or a bowl of potato mash with plenty of butter and hot milk. Reheat beef cheeks until piping hot, adding a little parsley. 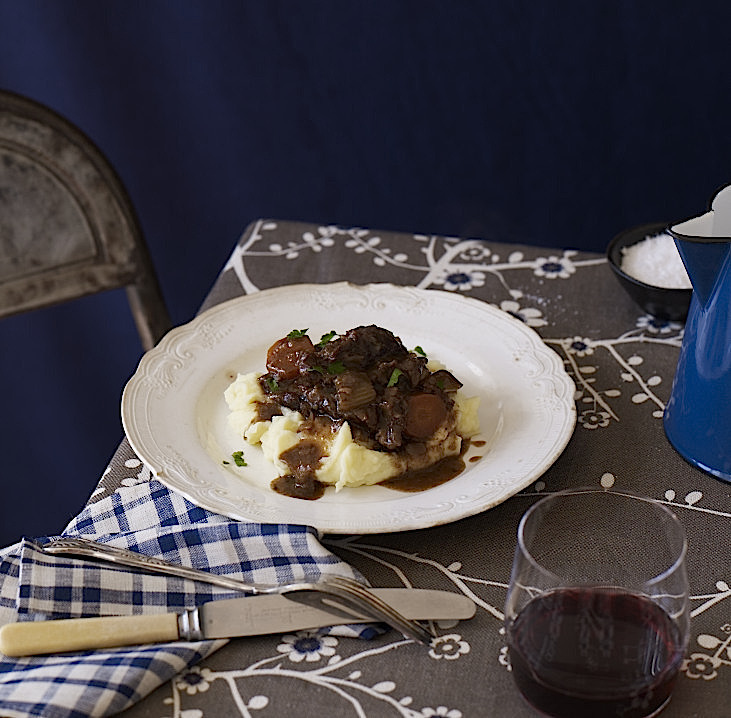 Spoon generous dollops of polenta or mash onto warmed plates and top with spoonfuls of beef. Serve immediately.